Melania Trump donated her inaugural ball gown Friday to the Smithsonian's First Ladies Collection, as previous first ladies have done. The first lady's vanilla silk, off-the-shoulder gown was presented to the museum during a ceremony Friday in Washington. The gown also featured a slit skirt, ruffled accent trim from the neckline to the hem and a claret ribbon around the waist. Mrs. Trump worked with designer Herve Pierre on the gown. In an interview with Harper's Bazaar, Pierre said Mrs. Trump requested a simple and elegant dress. "The lines are as sleek as a paper cut; the curves of the skirt are fluid, yet the overall shape is sharp and intense. For me it reflects her personality," Pierre told the magazine. "It was important for us not to follow any recipe for a 'First Lady gown.'" Recalling the inaugural ball on Jan. 20, Pierre said when the president saw the first lady in the dress for the first time he said, "Whoa, that's really gorgeous." Pierre attend the event along with 200 other guests at the National Museum of American History. 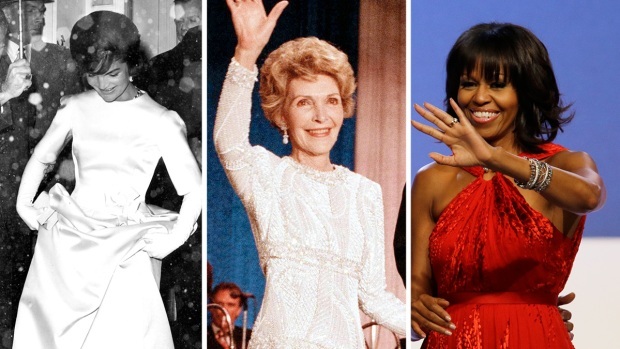 Mrs. Trump's gown will be added to the exhibit that features 26 dresses, including some worn by Jacqueline Kennedy, Laura Bush and Michelle Obama, along with other items.